Can big data make society healthier? Imagine a situation when your boss sends you to meet with a client in a town you didn’t know existed. After a couple hours on the road, you arrive in the town and make a quick stop at a cafe to refuel on a chicken caesar salad before heading to your meeting. The next week you miss three days of work because of a bad case of food poisoning. The culprit? The chef at the cafe didn’t know that the chicken he took out of the freezer and put on your salad had been recalled a week ago. In another situation you might have entered an area that had a disease outbreak or a boil-water advisory. In an era of mobility, connectivity, and data, we should be leveraging technologies to ensure that we get real-time health and safety data so that we can make informed decisions as consumers. Dr. Jeff Aramini, who worked for the government as an epidemiologist for nearly a decade, recalls talking to a mother of a child sick with E.coli while investigating a foodborne outbreak. The mother was waiting for a kidney transplant and prepared frozen hamburgers for her family that had been recalled a couple months ago. She hadn’t heard about the recall. “We don’t know how often this happens. Every day there are food recalls and there are about 1,500 boil-water advisories. None of these events have to be emergencies. If we know that we should throw out those hamburgers or we should return the car seat then, we can avoid people getting sick,” Aramini said. 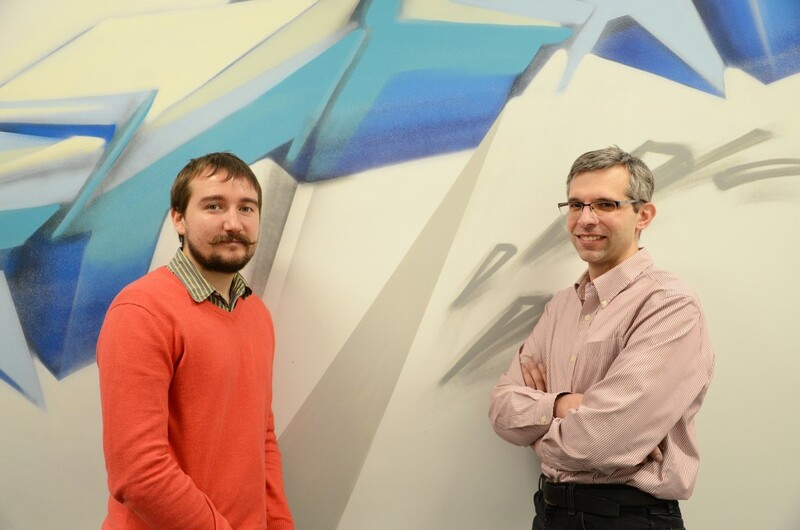 Dr. Jeff Aramini, President & CEO of Intelligent Health Solutions, and Ilya Peskov, Director of Innovation at Intelligent Health Solutions, in front of artwork at Cummunitech, a Waterloo region hub for the commercialization of innovative technologies. Intelligent Health Solutions moved its office to Communitech this January. Photo by Alexandru Vilciu, UI/UX Designer at Intelligent Health Solutions. Aramini incorporated Intelligent Health Solutions (IHS) in 2008. IHS specializes in health and safety informatics and providing critical real-time public health information tailored to the needs of individuals. Its most recent product is the Health & Safety Watch, a Web-based service with a companion app. Health & Safety Watch is similar to the The Weather Network. The Weather Network sources data from Environment Canada while Health & Safety Watch sources data from Health Canada and about 200 websites. To make informed decisions, we need relevant and real-time weather information. Similarly, we need relevant and real-time public health information. “If you drive into a town with a boil-water advisory and you don’t know about it and drink the water you get sick. But, if your phone tells you that you just drove into a town with a boil-water advisory then you’re safe,” Aramini said. Health & Safety Watch provides information on food, consumer product, and drug recalls, disease outbreaks and public health alerts, drinking water, environmental, and travel advisories, and restaurant inspections. Users can customize various filters on their Health & Safety Watch profiles to their needs. For example, if you live in Toronto and your parents live in Vancouver, you can setup your settings so that you get only geographically relevant notifications. If you have a peanut allergy, you can enter it into your profile. “It’s a century of transparency. People have become smarter news consumers. They don’t simply go with what they see. They do research. We’re not telling our users to buy or not to buy things. We show them information we found from different sources so they can make informed decisions,” said Ilya Peskov, Director of Innovation. Public health information is not easily accessible. “On the health side, the culture for the longest time has been around being worried that people will misinterpret the data or “data is power,” Aramini said. Health & Safety Watch relies on a full-time person dedicated to looking through data that is missed by “data scrapers” such as notes written by inspectors on PDF files. Governmental organizations would have to move to “open data” and a universal format to make full automation possible. IHS launched a pilot in Toronto that makes restaurant inspection data available to its users. “We expected everyone to shut their door,” Peskov said. But, the pilot was successful and lead to a pilot in the Peel region. “Instead of investing in making apps and websites, it’s cheaper for governmental organizations to make data open so that innovators can figure out a way to leverage it and build a business model. What motivates us is that there are people in the government sector who like what we did and they see a future in it and they want to partner with us,” Peskov said. To learn more about Intelligent Health Solutions and Health & Safety Watch, visit www.ihealthsolutions.net and www.healthandsafetywatch.com.